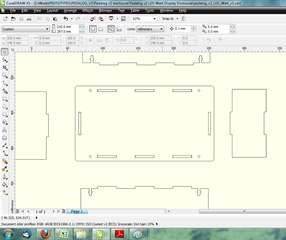 In this post I’m documenting my process for designing enclosures for some of my projects. 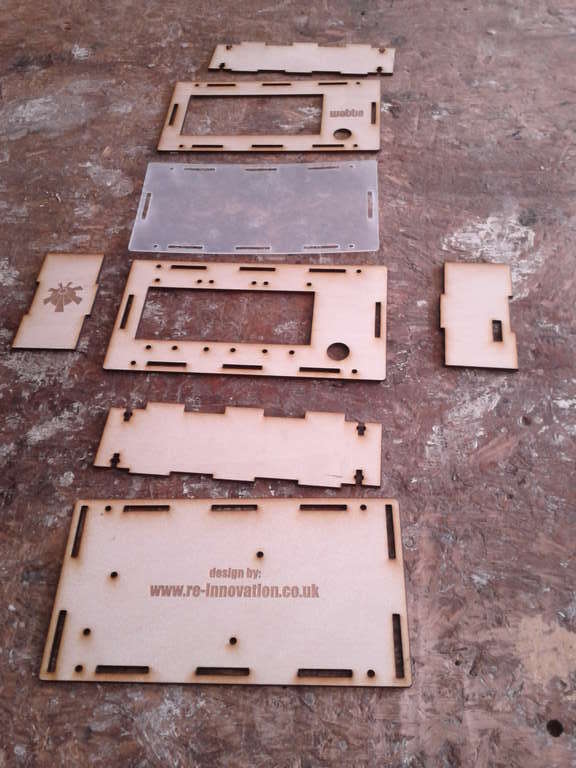 This is the design process I use to produce bespoke enclosures with cut-outs, using the laser cutter at Nottingham hackspace and 3mm plywood. 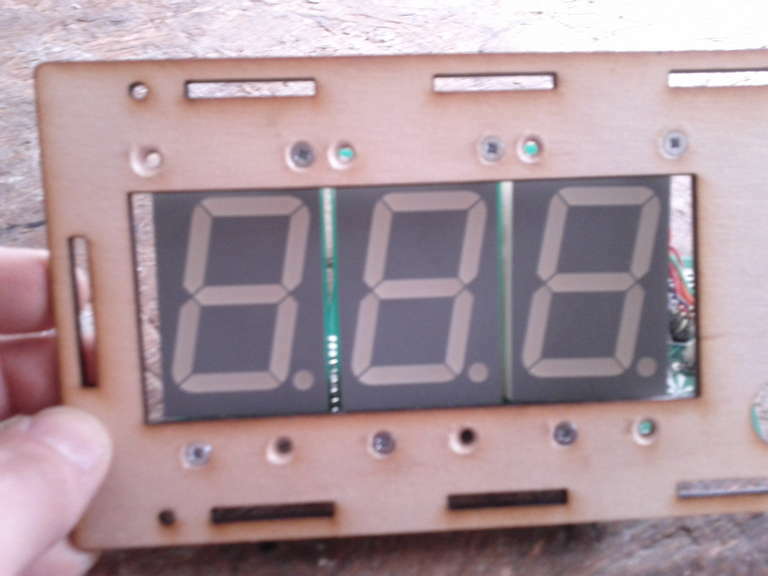 In this example I’m designing the enclosure for a power monitor with a large 7-segment LED display. This is a relatively complex design, but this will show my design choices. Firstly I measure the internal dimensions required to fit everything. 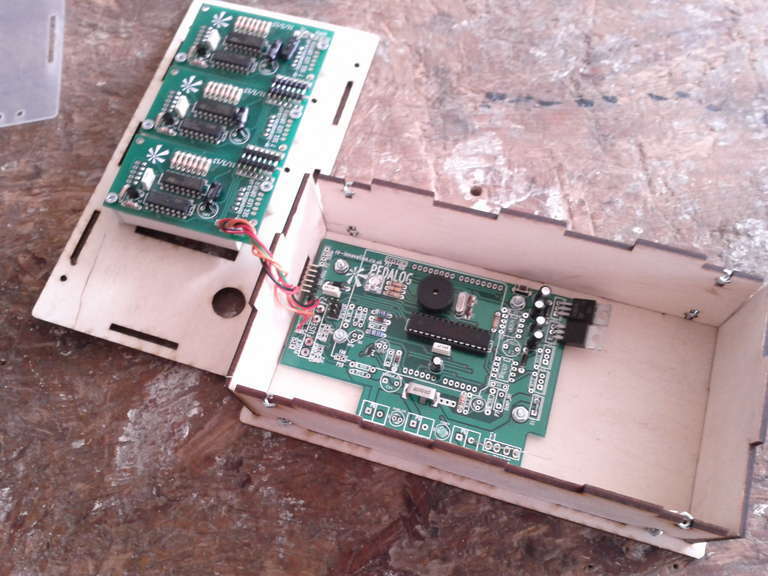 In this example I am using two circuit boards, one on top of the other. The only tool really required is an accurate ruler – decent quality metal ones are generally best. 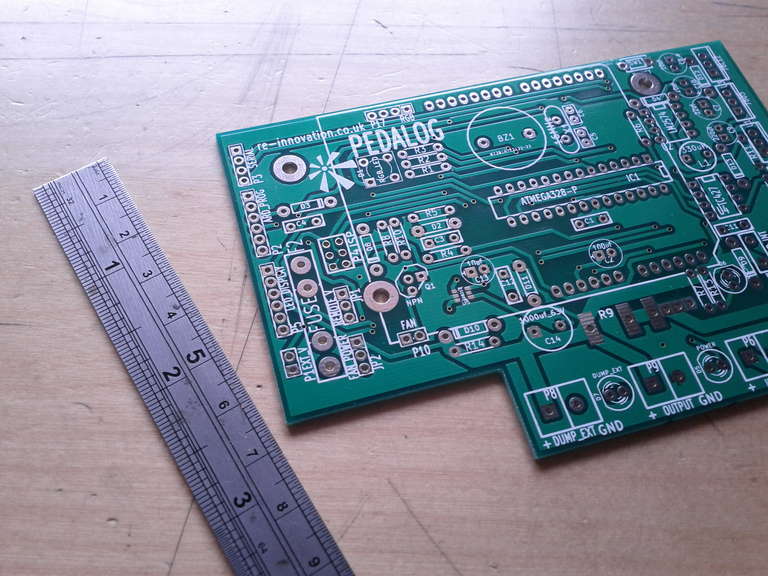 My design requires minimum internal dimensions of 170mm wide x 80mm high x 40mm deep. I don’t want to be squashing anything in and being a bit bigger is not an issue, so I’m adding on a small factor to give me some ‘wiggle’ room. 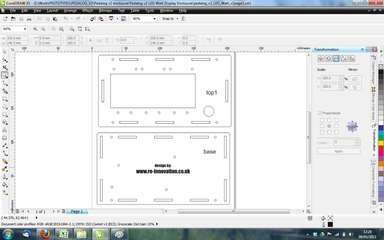 The final internal dimensions I am using are 180mm wide x 90mm high x 45mm deep. I generally use sheets of 3mm plywood. 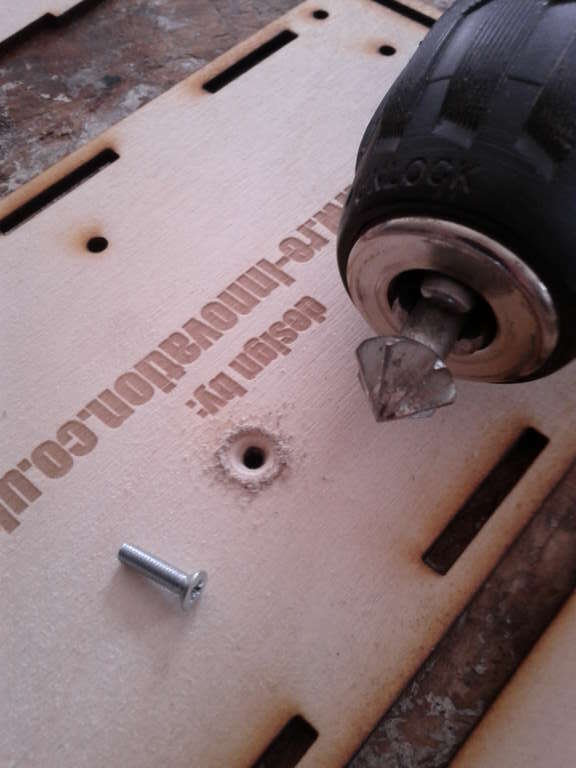 I use special (and more expensive) ‘laser-cutter’ plywood. 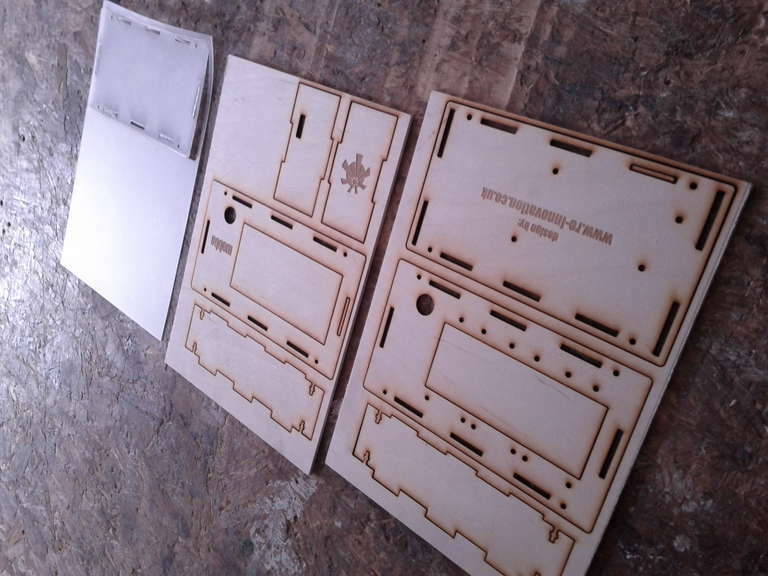 Laserable plywood is better quality and each layer within the ply is good quality (rather than the board obtained from DIY shops, which will generally use filler for holes within the layers). These designs could also be done in acrylic, which is also easily cut on a laser cutter. The main problem with plywood is the variation in the density of the wood. 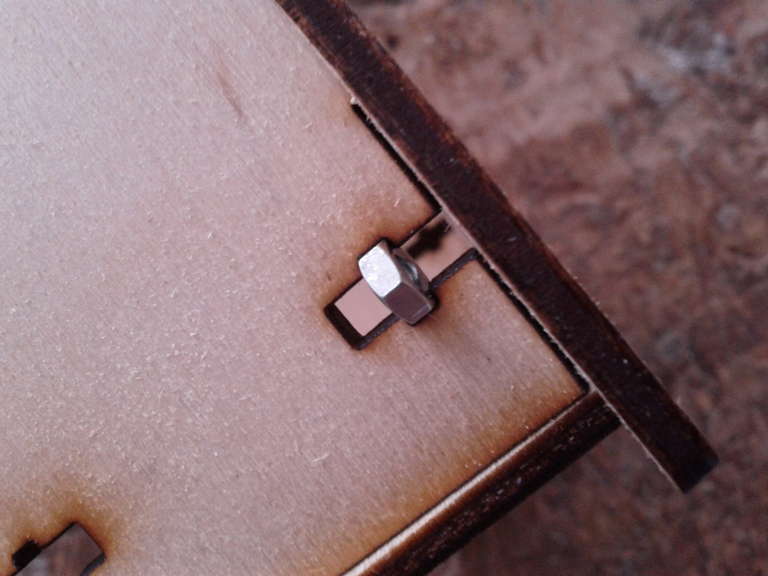 This means that sometimes the laser will not cut perfectly all the way through (when it hits a really dense bit). You can compensate for this by reducing the speed at which you cut or increasing the power, but that makes the whole cutting process slower. 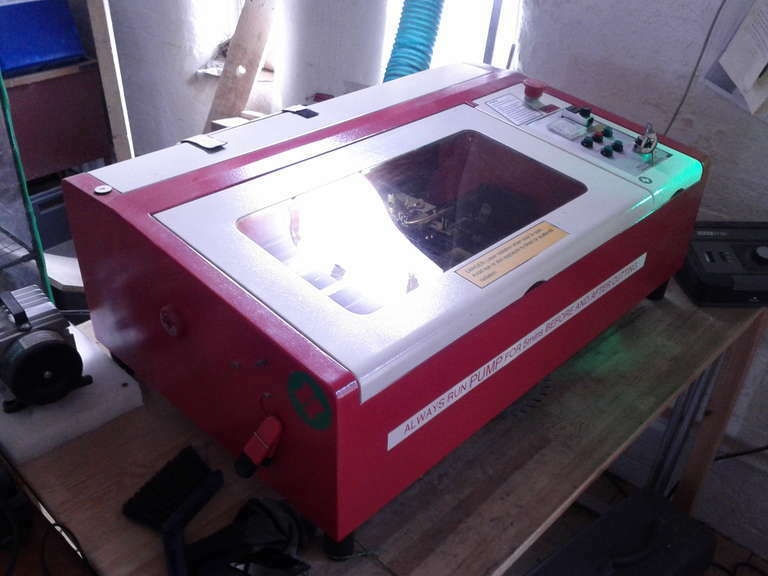 My laser materials are generally sourced from Hobarts Laserables, based in the UK. There are lots of other suppliers. 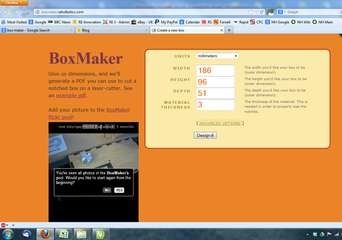 I then use a great program called ‘Box Maker’ by Rahulbotics. 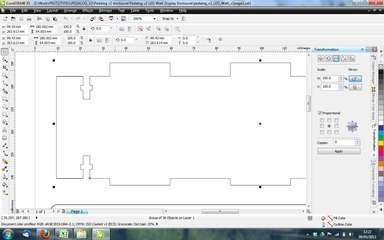 This is a program to automatically create a notched box. It is American (I think), so automatically opens in inches. I use the millimeters setting. The dimensions entered are the external dimensions. As I am using 3mm plywood, I need to add 6mm on to each dimension (3mm one each side = 6mm total). So I enter 186mm x 96mm x 51mm and 3mm as the material thickness. We also need to change the ‘Advanced Options’ a bit. So click on that. The ‘notch length’ is set to 7.5mm, which is not very long and will mean loads of notches and laser cutter time. I change this to between 20 and 30mm. We are not gluing the box together, but using a slide fit for the notches (this will become apparent later), hence we do not need lots of short notches. Click on the ‘Design it!’ button and you will be asked to as a .pdf file. Save this somewhere sensible and have a look at it. You can seen the 6 pieces required to make a box. 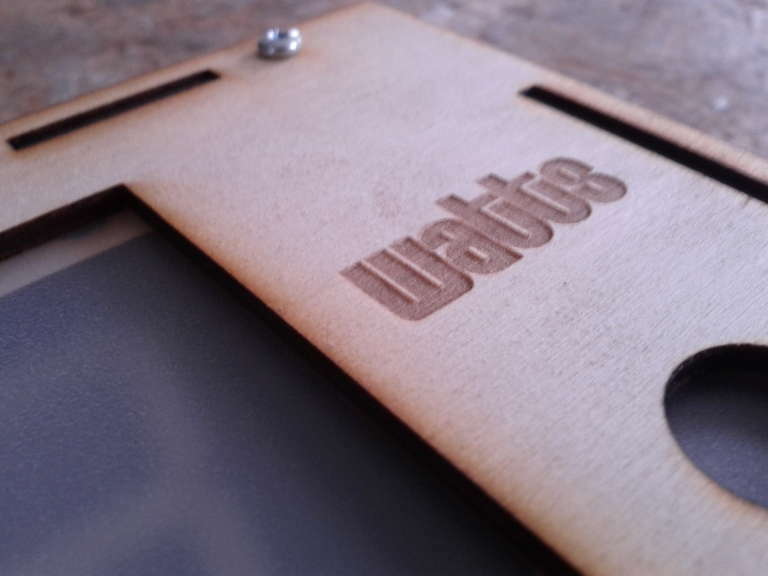 This design can be used directly: laser cut it and it will fit together. This is OK if its going to be glued and never opened up, but I need access to the inside of the box. I also need additional cuts and slots, so lets try changing the box. 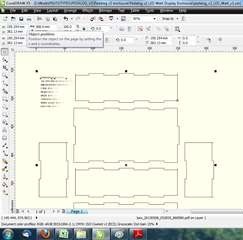 To do this you will need some graphic or CAD editing package. I use CorelDraw as I am very used to it, but it is proprietary and closed. For open source alternatives, I would suggest InkScape. 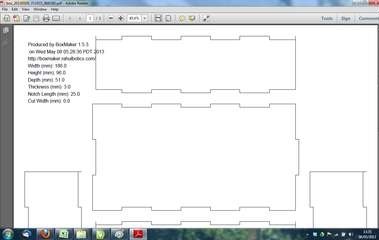 Open a New sheet and ‘Import’ the box design .pdf. It should load as an object. You might get asked how to import the text, either as Text or Curves. I use ‘Text’ as I will remove it soon. 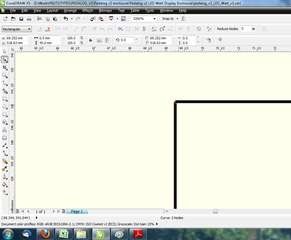 Click on the object and ‘ungroup’ it. This will give you access to every line. I then click on and delete the text, as it is not required. You might also get some lines which will not cut correctly at the end of one of the sides. I click on the node and move it so it creates a proper shape. Rather than using notches and glue, I will be using slots/notches and T-nut holders. I will explain these in more detail later (mainly check out the photos). 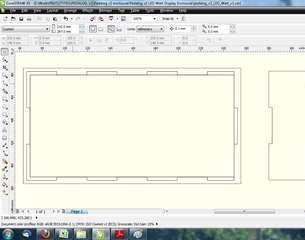 Firstly I create a rectangle which is bigger than the base/top section. The side sections remain untouched. 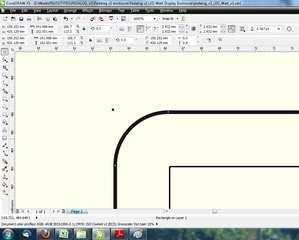 In this example I use a 5mm boundary around the whole shape. The base will probably be identical, so use the copy and paste function to create a copy. We now have the correct sized top and bottom pieces. 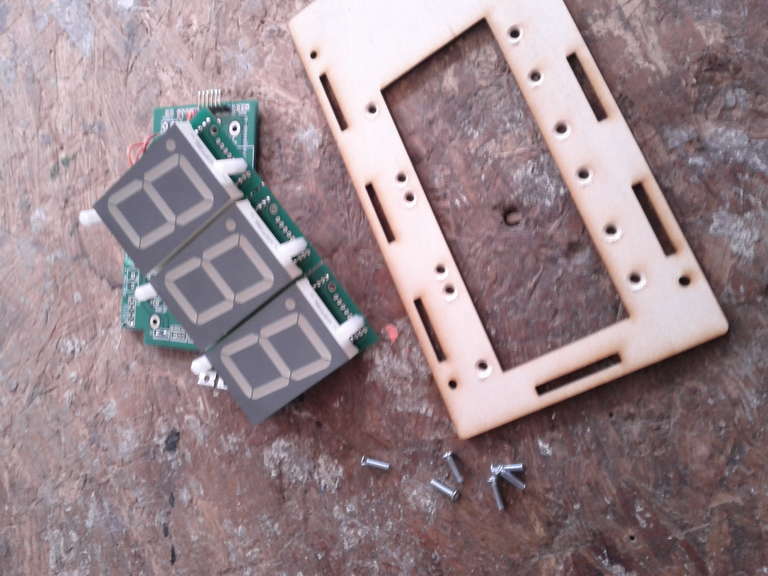 It might be a good idea to add text to each piece now so that you remember which is to top/bottom etc, and also the orientation as this can get a bit confusing when designing slots and mounting holes. We need to add the T-nut holder notches. 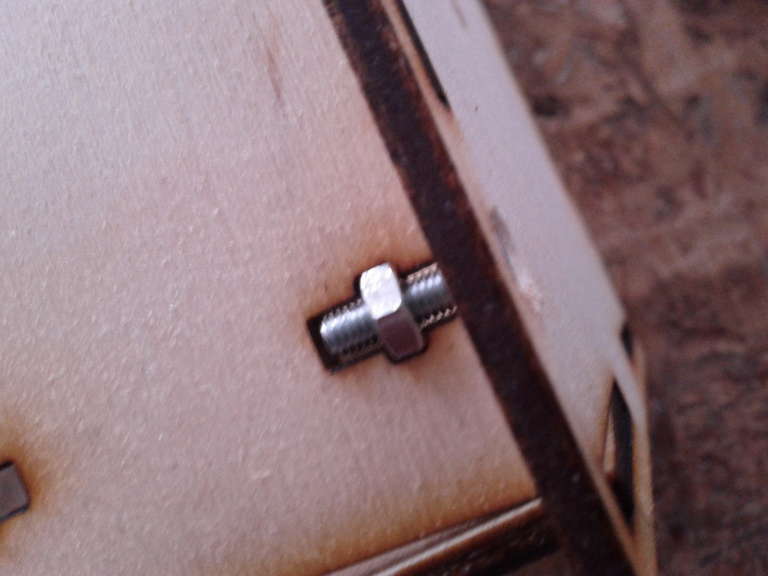 These notches are the correct size to hold a 3mm nut and also a slot foe the machine screw to link to the nut. Check out the photos for more info, as it becomes obvious. I found the size of these T-nut holders by trial and error using a laser cutter. I use 3mm nuts and machine screws to hold everything together. You cannot just cut a 3mm wide hole, as this will be wider than 3mm due to the width of the laser beam cut (called the kerf). The T-nut holder is just big enough to hold the nut, but not allow it to spin around. 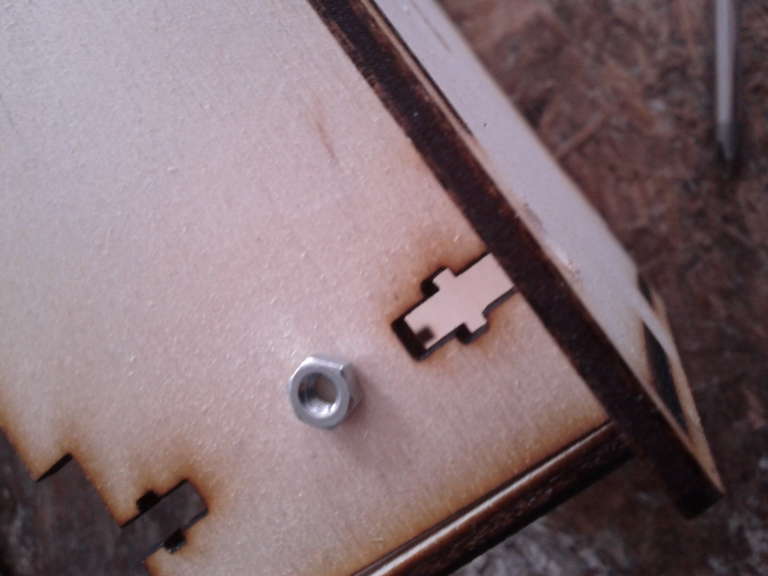 We also need to add hole cut outs for the machine screws to fit through. These must line up with the T-nut notches we have added to the sides. We can add as many T-nut notches as we like, but I generally use 4 per piece, unless the item is very large. This is a trade off between ‘hassle of getting it open’ and rigidity. This box design is a bit more intricate. 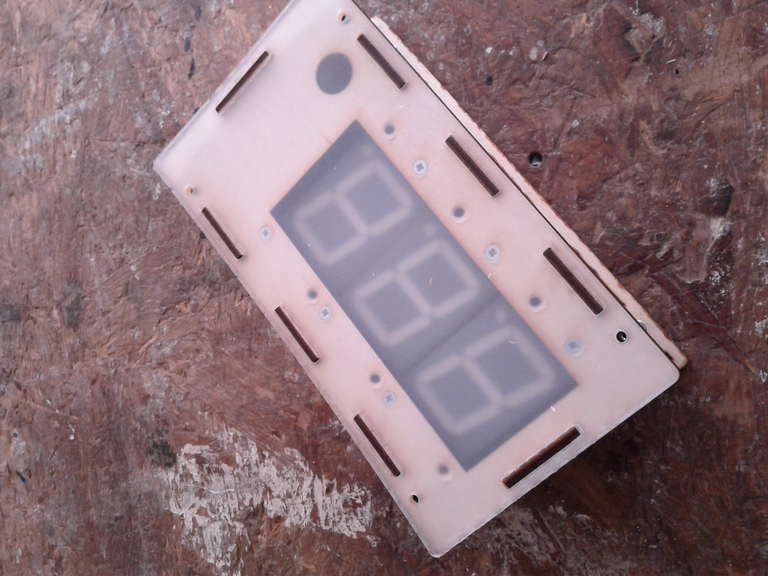 I need to add a ‘false’ front to hold the 7-segment LED boards. This will required more editing of the design. Firstly the from will be comprised of 7mm of material – this includes 2 x 3mm pieces of plywood and 1 x 1mm piece of polypropylene, which I am using as a diffuser. Hence I extend the notches on one side of the side pieces to 7mm. This notch will then fit through the slots cut in the three front pieces. This will be seen when it all fit together. 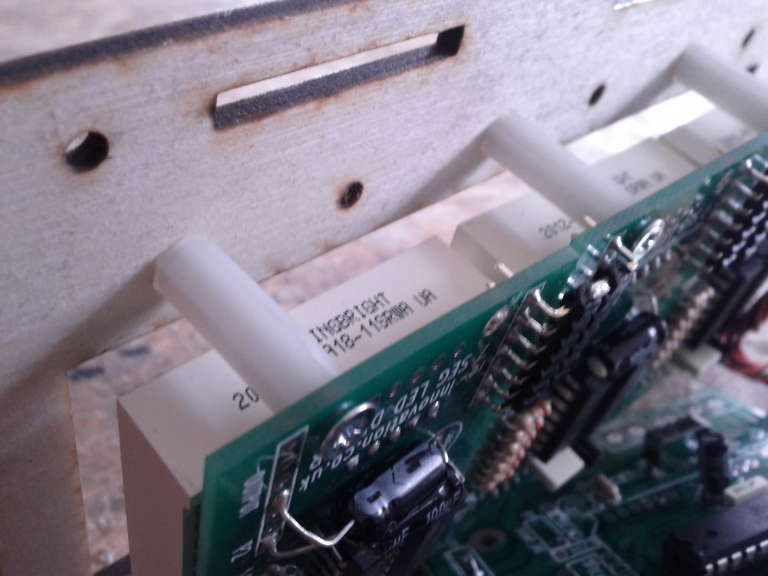 I also needed some holes to hold the circuit boards (PCBs) in place both on the the back plate and the front plate. I do some accurate measurements using a ruler (calipers might be better). 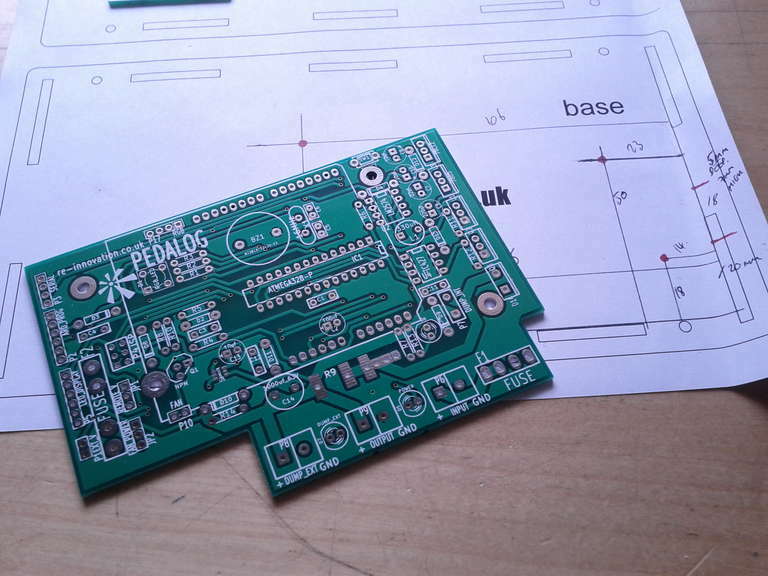 I then print out the piece onto paper and align the PCB to check the holes match. If they do not, I adjust accordingly and re-print the paper. Lastly I need cut outs for the LED display, the RGB LED unit and the programming cable. These are done with measurements from a ruler and then printing the design out to double check and correct if required. 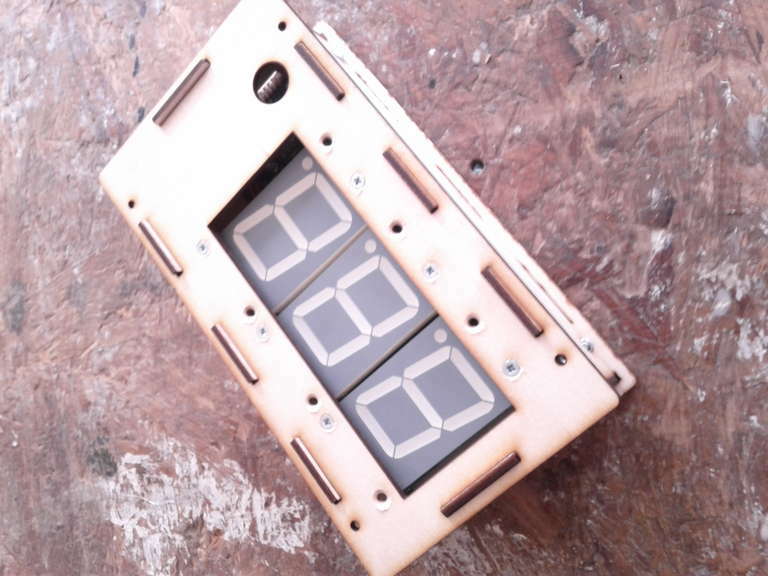 The final design, with some text and various holes to hold the PCBs. 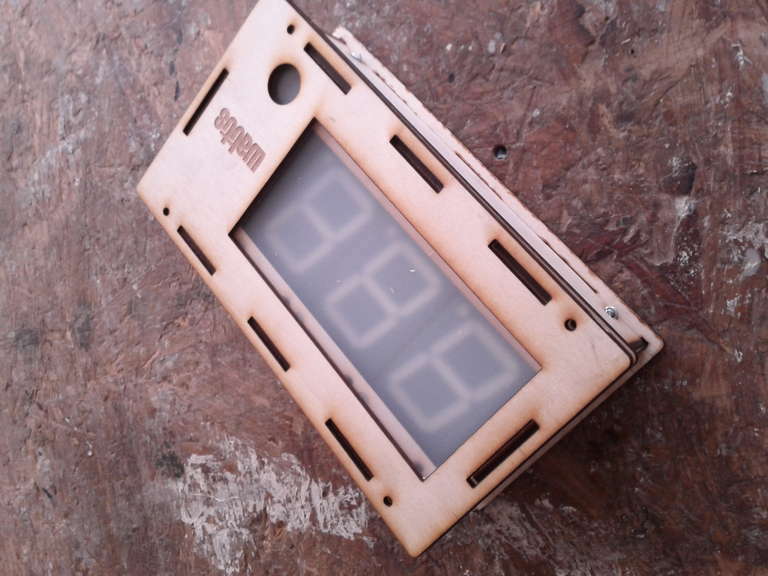 Once the design is finished you must output a file which can be read by the laser cutter control software. 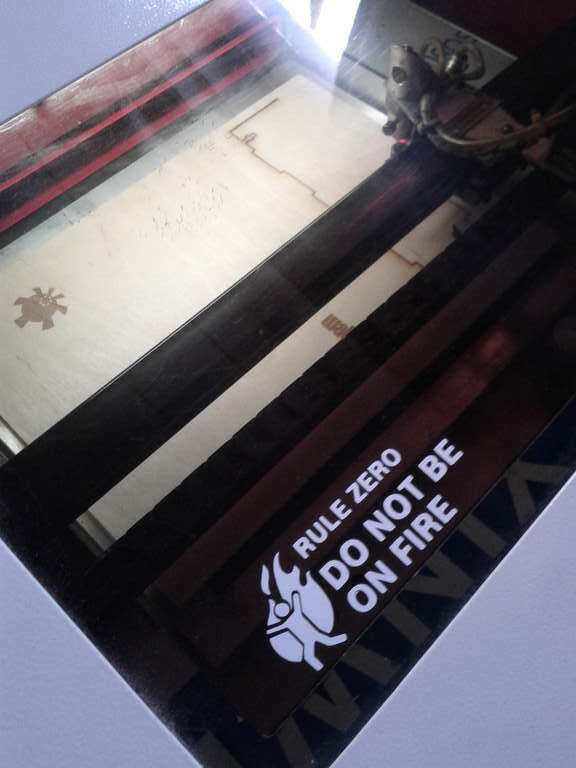 The laser cutter I use has the program ‘Newly Draw’, which came with the laser cutter. 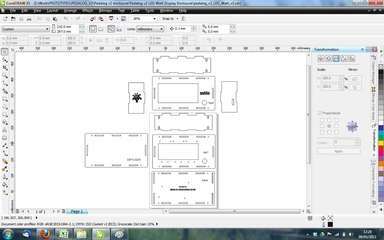 It can accept the .dxf format (which is a standard 2D design format). 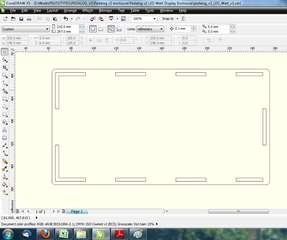 So I export my design from CorelDraw as a .dxf file. 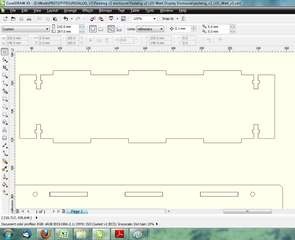 I then import that .dxf into Newly Draw. This process may vary depending upon your set-up. Ensure the power and speed settings are correct to cut out every part. 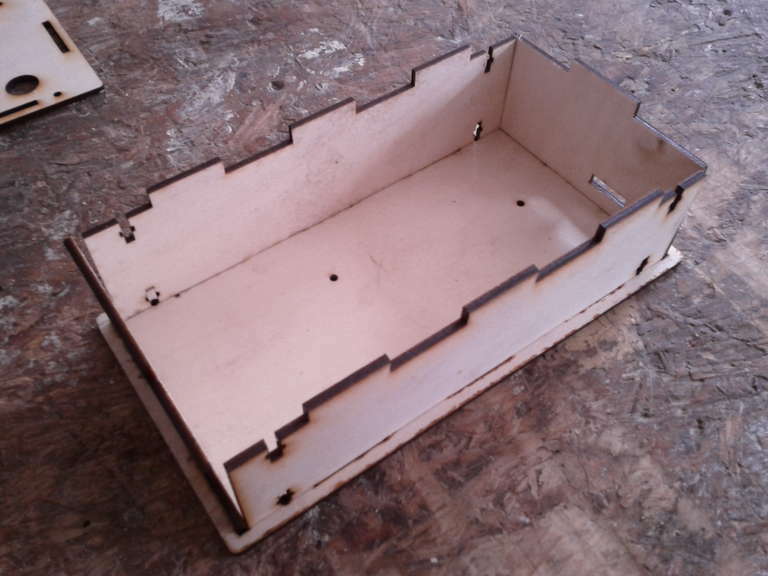 This enclosure took around 30mins in total to cut, but that is mainly due to the ‘etch’ onto the box, which takes quite a long time. First remove the parts from the excess material and lay out all the parts in the correct pattern. Some of the machine screws I am using have countersunk heads. This means that they will not stick up out of the surface. I use these on the back of the unit so that it will sit flat upon a table. These must be counter sunk using a counter sink bit and a drill. This is done by hand. 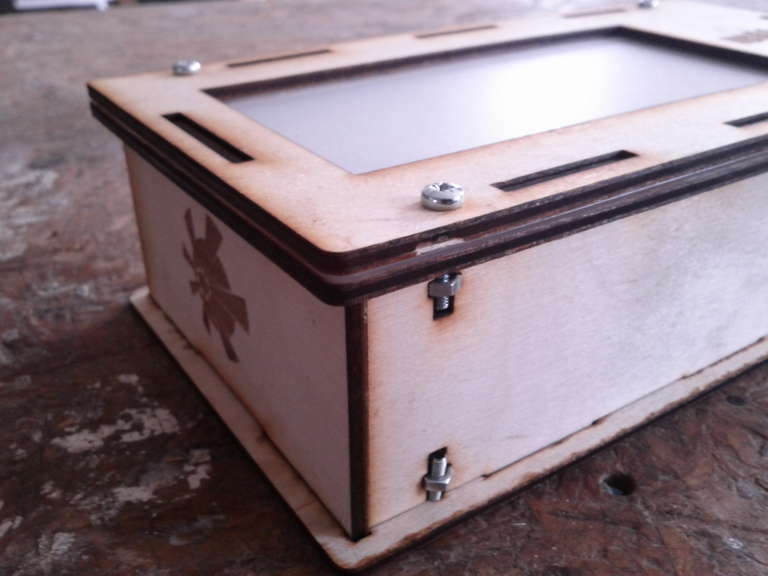 that has demistified some of the design a box process, and great links to the box maker – what a time saver! Thank you so much for the detailed info! Quoting Konstantin: Thank you so much for the detailed info! 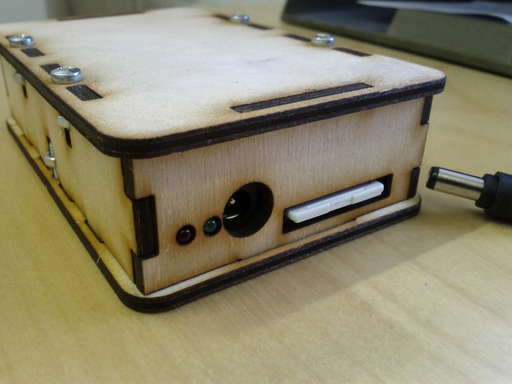 Great stuff – I’ll check out your app when I’m next making and enclosure! 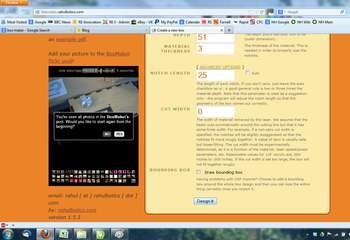 Try (this) my online boxdesigner tool. Actually more than 30 box types! This is just what I was looking for. great !!!! Is there a boxmaker that will do triangle boxes or other odd shapes? 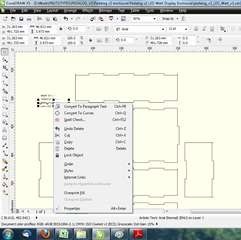 Any reason why you used 2D design software? Do you know of any 3D software that makes this easier to do?